Graphic design is an art form that stands all on its own. It is a way for an artist to create a masterpiece to help a business stand apart from the rest. It gives a business a branding identity that people can identify with and recognize the company. 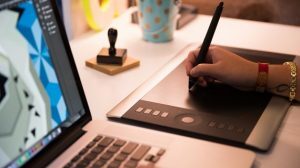 If you are wanting to be a graphic design artist, there are some things you need to keep in mind. In order for a business to be recognized and stand out from the others, they need a design that is informative and eye catching. There are a few things to keep in mind when you are trying to design for a business. The design should have good readability. The ideas in the design should be consistent. You don’t want to confuse your potential customers, but to help them understand what is being offered. If it is easy to read, your customers will know what is being offered. You will want everything to be organized visually. The illustrations, designs, and main image needs to target your audience and describe your purpose. Everything in the design should be relevant, making the site more friendly and usable to the visitors. It is important to consult regularly with the business you are working with to incorporate their ideas and thoughts into the ultimate design. You will want to focus on the elements that help a graphic design stand out, such as texture, mass, shape, lines, and colors. The design must also be easy to understand so the audience can get to the point quickly and have an effective presentation and easy on the eye. The main thing, though, is to stay true to yourself. You were hired to do the job because the company liked your ideas and your portfolio. Listen to their needs and wants and take them into consideration, but make sure that the design represents who you are as an artist. Consistency is a great characteristic for any artist.